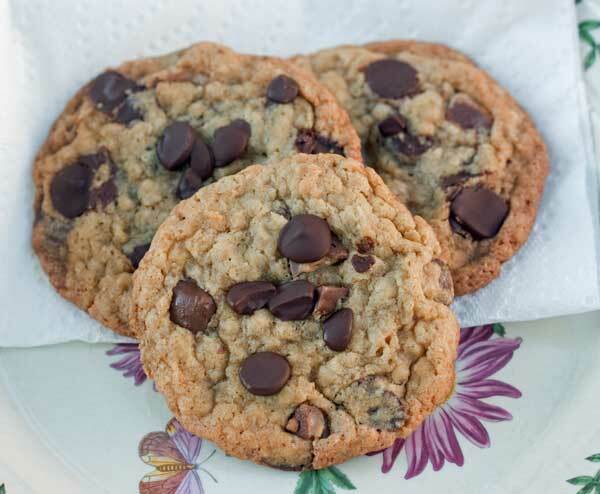 Back in January King Arthur Flour named this Oatmeal Chocolate Chip Cookies recipe as their cookie of the year. Like a lot of people, I have multiple versions of oatmeal chocolate chip cookie recipes, but since this one was named cookie of the year, I had to try it. To personalize the recipe a bit, I made the cookies “palm size”, used only 2 cups of chocolate chips and added some chopped up Heath bars. The cookies were really, really, great — definitely deserving of King Arthur’s title. There wasn’t anything wrong with the recipe, but I did include some notes that might help you if you want to try the cookies, too. King Arthur recipes always include gram weights, so I made these using their gram measurements. If you measure by volume, make sure to measure your flour with a light hand, as KA’s 2 cups weighs only 8 ½ oz/240 grams (a typical Cook’s Illustrated 2 cups weighs about 10 ounces/280 grams). And while it may sound picky to point that out, it’s not because even small changes in the amount of flour make a difference. Then again, I think if you did use a heavier 2 cups of flour you’d still get a good cookie. 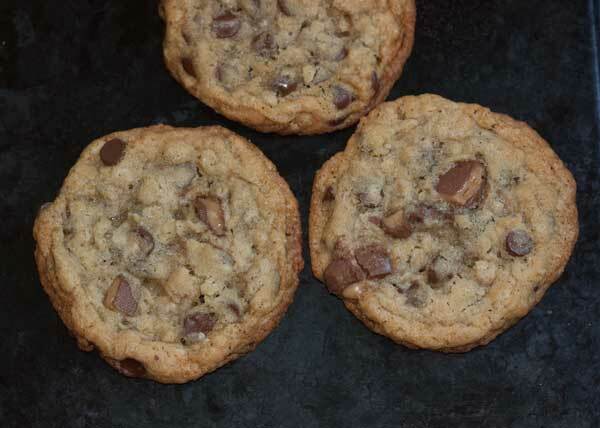 Here’s another picture of the cookies made with smaller chocolate chips. Yes, I liked them so much a I made a second batch. Oatmeal Chocolate Chip Cookies With Toffee are chewy, easy to make and probably the best oatmeal chocolate chip recipe I know. Dough needs chilling, so don't preheat quite yet. Combine the flour, baking powder, baking soda and salt and stir well. Set aside. In a mixing bowl, beat the butter until creamy. Add the sugars and beat, scraping bowl often, for about 2 minutes. Add the egg, egg yolk and vanilla and beat until light and fluffy. By hand or using lowest speed of a stand mixer paddle, stir in the flour mixture until incorporated. Stir in the oats, then stir in the Heath bars and chocolate chips. Divide the dough into 20 equal portions onto a couple of foil lined plates or a baking sheet that fits into your refrigerator. Chill the unbaked mounds of dough for about an hour. When ready to bake, preheat oven to 325. Arrange dough balls on parchment lined baking sheets spacing about 2 ½ inches apart and bake for about 18 minutes (start checking at 15) or until they appear just set and edges are brown. The centers will be quite pale and may seem underbaked, but they will cook internally as they sit. Let cool on baking sheet for about 8 minutes, then carefully transfer to a wire rack where they can finish cooling. Alternatively, you may divide each 1/20th in half and make 40 smaller cookies. If making the smaller size cookies, start checking at 12 minute. The edges tend to brown a lot quicker than the centers. Note: I weighed all my ingredients. If you are using volume measurements, make sure to really fluff up and aerate your flour, then spoon and sweep to get just the right amount. Usually 2 cups of flour weighs 9 or 10 oz, but in this recipe it weighs 240 grams which is only 8 ½ oz. I need to look through my notes. I think I tried these. Yours look like they turned out really well. I haven’t made the One Bowl cookies in a while, so thanks for the reminder. We just moved into a new place and I literally have only one mixing bowl. Let me know what you think of these. Earlier this week, when I realized I didn’t have dark brown sugar to make my favorite chocolate chip cookie, Lee’s Chocolate Chip Cookies you posted on 6/16/2008, I knew you’d have a great alternative. I quickly found and mixed your “Another One Bowl Cookie” from 7/15/2008. They were a hit with everyone, most especially my husband and father! I can’t believe how the time has flown since you posted these recipes. Can’t wait to try this new recipe – I love oatmeal cookies and Heath Bars!